CBETA is currently being built as a prototype for the RHIC-II and eRHIC at Brookhaven National Lab. First conceived by Cornell Professor Maury Tigner, Energy Recovery Linacs (ERLs) recover the energy of a used electron beam in order to accelerate more beam. This energy-saving arrangement allows for far larger beam current than similar conventional accelerators. At Cornell, Professor Georg Hoffstaetter has been leading the ERL R&D effort first for the design of an ERL as a hard-x-rays source and currently for building an ERL in a collaboration with Brookhaven National Laboratory (BNL), the Cornell-BNL ERL Test Accelerator (CBETA). As an ERL with superconducting (SRF) acceleration, 4 accelerating and decelerating turns, all captured by a single return loop enabled by Fixed Field Alternating Gradient (FFAG) permanent magnets, CBETA is the world's first of its kind. 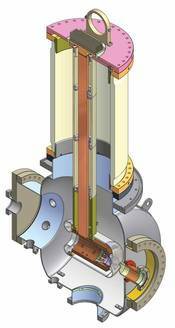 It saves energy not only by using ERL technology, but also with permanent magnets and by using superconducting accelerating structures. CBETA is a prototype for the 4 km long nuclear physics collider eRHIC planned at BNL, its beam can also be used for basic physics experiments at Cornell in the fields of elementary particle physics, x-ray science, and for intense Terahertz radiation. The high-beam-power technology it employs can be used in other accelerators that have far-reaching implications for biology, chemistry, pharmaceuticals, cancer therapy, and a host of other disciplines that are enabled by particle beams. Before the CBETA project, Cornell designed a hard-x-ray ERL light source for research in many scientific fields from material science to medicine, pushing x-ray light sources like CHESS to the world frontier. CBETA is based on the components that were prototyped for this x-ray ERL, it's electron source, its SRF injector linac, and its main ERL accelerating module. 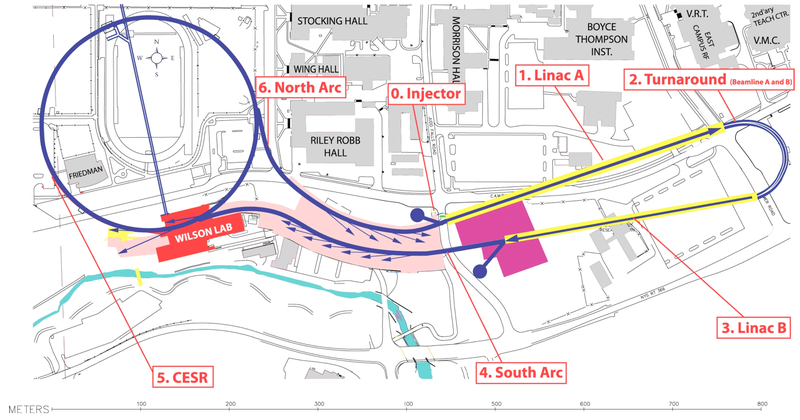 The ERL designed at Cornell as an upgrade to the Cornell High Energy Synchrotron Source (CHESS) and will be the first-ever ERL x-ray source. For details please see the Cornell ERL Science Case and Cornell ERL PDDR. This photocathode gun, which is part of the ERL injector, is where high brightness electron bunches are created. X-ray beams from charged particle accelerators have become an essential tool in today's investigation of all types of materials, from airplane wings to cell membranes and from pollutants in leaves to matter under earth-core pressures. The development of a hard-x-ray ERL, envisioned and invented at Cornell, provides more brilliant beams in shorter pulses and with less energy spread. It can move such investigations to new frontiers.